It has been a month now!! 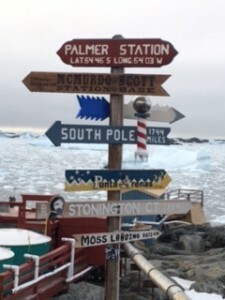 So it is hard to imagine that I have been at Palmer Station for a month and 2 days now. The time has flown by and I still feel like there is a lot of work to be done. The weather has been on and off for the last two weeks. We have had winds exceeding 60mph that have kept us from going out on the water. Even when the winds are non existent, we have not been able to go out as the harbor has filled up with lots of brash ice. It has been a slow year for biopsy sampling thus far. We normally, or well at least our team last year, had about 40 biopsy samples by now. I think Doug and I have only collected 13 as of yesterday. We have only seen two whales in the last two weeks. One was a single individual and the other was a mother calf pair and wow, was that calf curios. It would come right up to the boat, practically nudging the boat with the end of its mouth. It was quite the encounter to witness. Ari and Erin should be arriving at station on Friday, which means Doug is going to head back north. Erin will be joining me at station and we will be here until April 9th, I believe. Life on station is pretty calm, but we try and stick to a pretty tight schedule to keep ourselves on track and busy. Things can get a bit challenging down here when you find yourself engulfed with boredom. Generally, we work all morning and until dinner, and some days we will be on the water well after dinner until about 9:30pm, when the sun starts to set. After dinner then we generally hang out upstairs in the lounge, make a drink, eat popcorn, and watch movies. This week we welcomed Dr. Bill Fraser, a famous penguin biologist to the station. 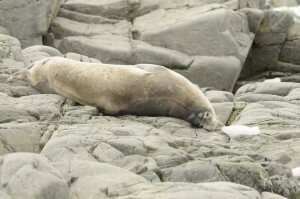 He has been coming down to Palmer Station for the last 40 years. Sunday, Doug and I were invited to join his birding team and count and measure penguin and giant petrel chicks on Humble Island. It was amazing to hold a penguin chick and feel how strong they are, even when they are only a month old. 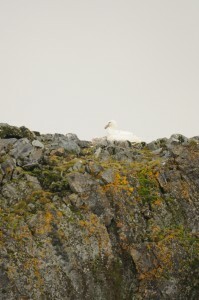 We counted skua nests, chicks, and eggs on Shortcut Island with the birders later that day as well. If you are unfamiliar with skuas, all you need to know is that they are relentless, will strategically poop on you, and will smash into your face at full speed if you go near their nest. Thankfully, I was wearing a hard hat. Even with my precautions these birds still seemed to nock it off my head twice, despite having it strapped to my head. At one point we were measuring one of the chicks, I believe at nest F1, and I was bent over holding the chick so Ben, one of the birders, could measure the beak as well as the first and second primary feathers, when all of a sudden I felt something land on my shoulder. I looked up and one of the chick’s parents had decided to land on my shoulder and peck at my head for about 15 seconds. At first I hated every notion of these birds, but seeing how protective they are about their young intrigued me. On a similar birding note, we have had four penguins jump into our boat so far. 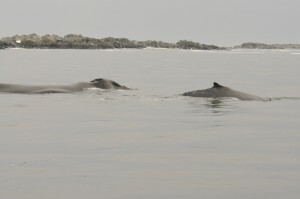 The first two made it up on to the side tube of the zodiac, quickly spun themselves around and shot back into the water. The other two made it directly into the boat and were assisted back out by Doug. One of the penguins that made it into the boat, jumped right in at our feet, getting the computer and GPS wet, stood up and looked at us, and then just stayed there. He did not care at all that we were there and just wanted to ride along for the day. Unfortunately he made it a bit challenging to do our work so we had to help him out of the boat as well. I cannot wait to see what the next two months has to offer down here. It is a beautiful place that I cannot even fully describe. I will check in again soon. Posted on February 10, 2016 February 16, 2016 Author pallinlTags Adelie penguin, Bill Fraser, giant petrel, Logan Pallin, Palmer LTERLeave a comment on It has been a month now! !